A little baby German Shepherd boy was born who found his way into an unhappy home where he was sadly mistreated. He was home castrated, had a tooth knocked out and due to mistreatment he ran away. Eventually he was picked up by the Swan Pound and ended up in death row. Julie who managed the pound phoned me and said she had this poor boy who was due to be put down in an hours time. I went to see him and took him home. First thing was to wash him as he was full of fleas, then a good meal. He was so thin his ribs were showing which made me think he had not eaten for a long time. When I went to sweep the yard he went into a fit, rolling on his back and foaming from the mouth. At first I thought he was having an epileptic fit, but then I realized he was afraid of the broom, in fact it turned out he was scared of people, sticks, plastic bags. Originally I had saved him to find him a good home, but he was such a mess both physically and mentally that I decided to keep him and look after him myself. A day later I took him for a walk in the park and thought that as he had the company of Sheba he would be alright off the lead to have a run with her however he took off and stayed a distance from us. He did not run away, but at the same time I could not get close enough to him to get him back on the lead. It took over an hour of coaxing to eventually get close enough to him to grab hold of him. He was just so scared and untrusting. I showed him heaps of kindness and the vet agreed when I took him for a checkup and his shots that he was about a year old. I Named him Ben. Within a few weeks he was gaining self confidence and would never be far from me, in fact he was always under my feet and wanting a cuddle. By now he was also looking much better with good food to fatten him up. He was also starting to enjoy playing with the ball and having tug and war games with Sheba. In fact he and Sheba even pulled on the same tennis ball trying to pull it from each others mouth. They where getting on real well together, all within a few weeks. Now it was training time. He and Sheba every weekend where put through their paces. He learnt fast and was eager to please. He could not swim though but ran up and down the waters edge to start with and eventually he went into the water but only as deep as he could stand. 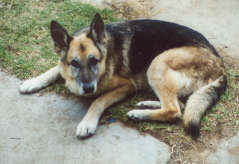 The reason he could not swim was because he had bad legs and suffered from crucia ligament problems in both back legs. One day when we where playing ball in the back yard he suddenly ran like his spine was broken. It was very frightening. It turned out to be his rear legs. He had crucia ligament problems. Eventually with the vets advice we decided to operate on his legs. His better leg was the first to be done. This in time was to prove a mistake as when he got older he had far more problems than his worse leg which was not operated on. Most the time however he was happy and could run and jump. Metacam was the magic mixture we gave him when he got older. A few doses and he was OK for up to 6 months.